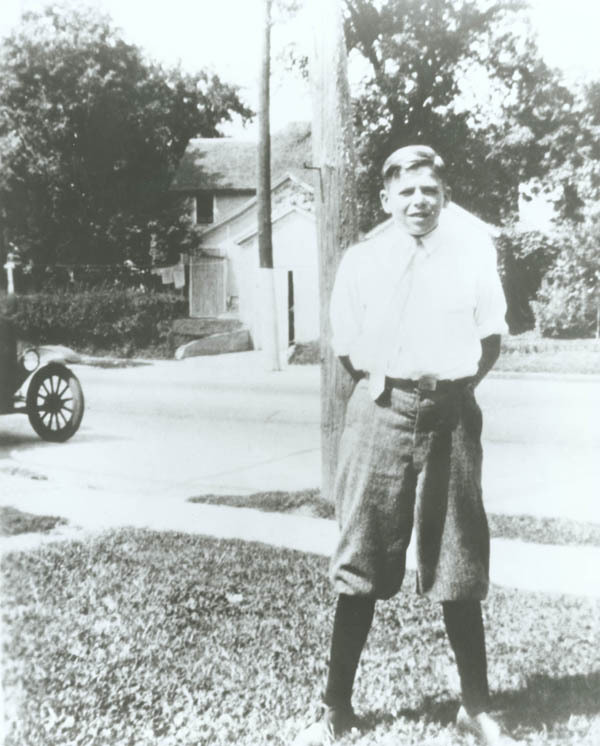 On February 6, 1911, Ronald Wilson Reagan was born to Nelle and John Reagan in Tampico, Illinois. He attended high school in nearby Dixon and then worked his way through Eureka College. There, he studied economics and sociology, played on the football team, and acted in school plays. Upon graduation, he became a radio sports announcer. A screen test in 1937 won him a contract in Hollywood. During the next two decades he appeared in 53 films. Ronald Wilson Reagan is born in Tampico, Ill., to Nelle Wilson Reagan and John Edward Reagan. The Reagans already had one previous son, Neil. After a series of moves in rural northern Illinois, the Reagans settle in Dixon, Ill., which Reagan considered his hometown. Reagan begins work as a lifeguard at Lowell Park, near Dixon. He was credited with saving 77 lives during the seven summers he worked there. 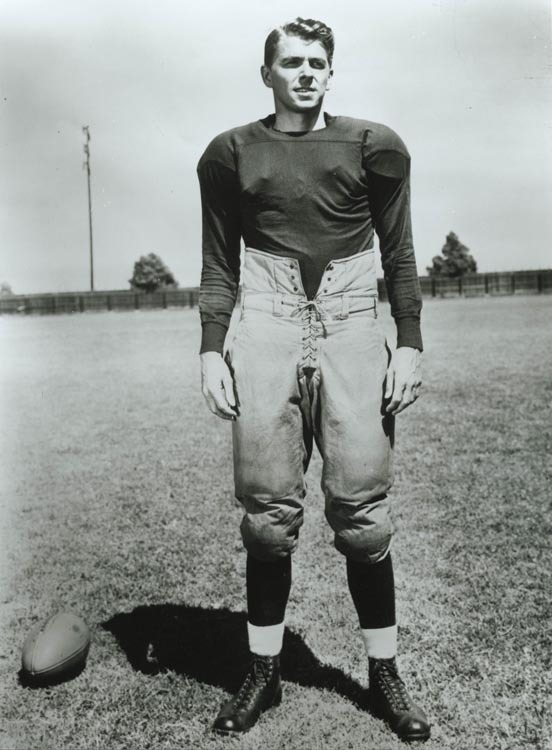 Reagan graduates from Dixon High School, where he was student body president and participated in football, basketball, track, and school plays. 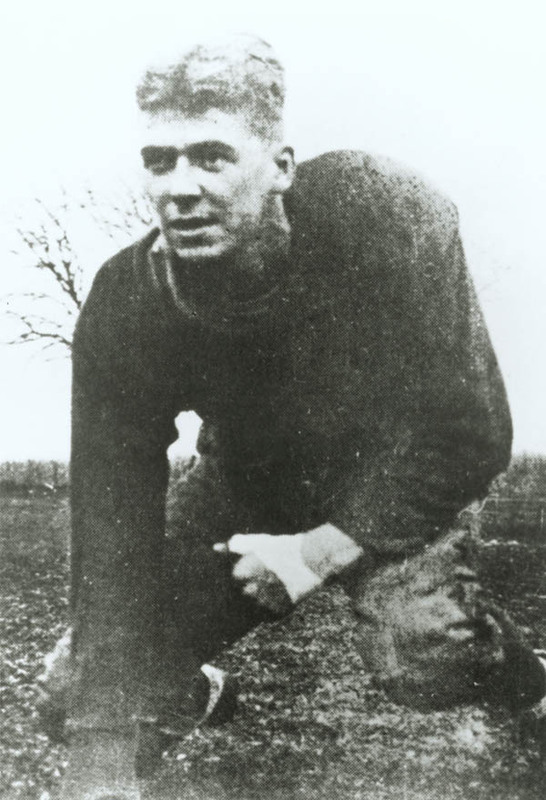 Reagan attends Eureka (Illinois) College, where he majored in economics and sociology. During his sophomore year, Reagan becomes interested in drama. Reagan also serves as student body president. Reagan enlists in the Army Reserve as a private but is soon promoted to 2nd lieutenant in the Officers Reserve Corps of the Cavalry. An agent for Warner Brothers "discovers" Reagan in Los Angeles and offers him a seven-year contract. 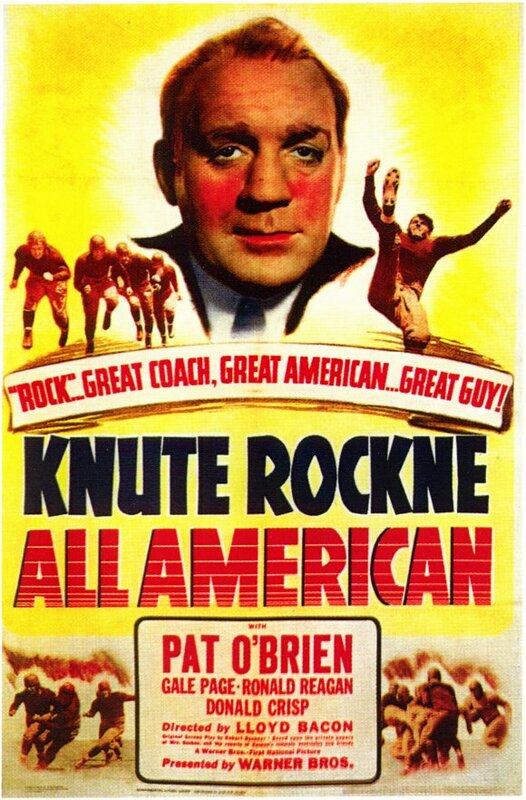 Reagan plays Notre Dame football legend George Gipp in his most acclaimed film, Knute Rockne, All American, The role earns Reagan the nickname "the Gipper." Listen to Reagan deliver his famous line from that movie. Reagan marries actress Jane Wyman, whom he met while making the movie Brother Rat. Reagan is called to active duty by the Army Air Force. He is assigned to the 1st Motion Picture Unit in Culver City, Calif., where he makes over 400 training films. 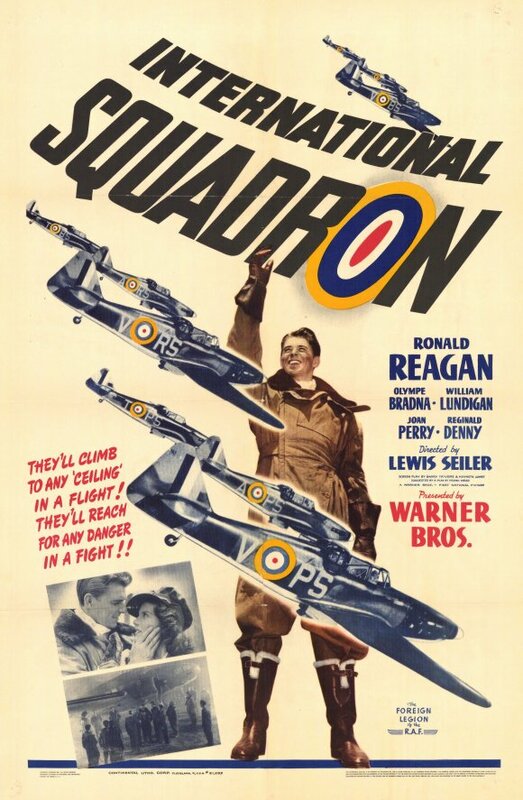 After the war, Reagan resumes his acting career, which continues for 20 years. Reagan makes 53 motion pictures and one television movie during his career. Elected president of the Screen Actors Guild for the first of five consecutive terms, Reagan testifies as a friendly witness before the House Committee on Un-American Activities. The hearings result in the blacklising of many writers and directors thought to have ties to the Communist Party. Reagan supports Harry Truman for president. Reagan campaigns for California Democrat Helen Gahagan Douglas in her bid for the U.S. Senate against Richard Nixon. Reagan campaigns as a Democrat for Eisenhower. Reagan and movie actress Nancy Davis wed. Daughter Patricia (Patti) is born. Reagan is hired to host the General Electric Theater on television, a job he holds for eight years. Reagan tours the country giving speeches as a GE spokesman. Reagan campaigns as a Democrat for President Dwight Eisenhower's re-election. Son Ronald Prescott (Ron) is born. Reagan campaigns as a Democrat for Richard Nixon for president. Reagan officially changes his party registration to Republican. Reagan gives a television address supporting Republican presidential candidate Barry Goldwater. The speech, called "A Time for Choosing," launches Reagan's political career. Watch or listen to that speech. Reagan's autobiography, Where's the Rest of Me? -- the title is a line from his 1942 movie King's Row -- is published. Reagan defeats incumbent California Gov. Edmund G. "Pat" Brown in a landslide. Reagan makes a tentative run for the presidency, waiting until the Republican National Convention in Miami to announce his candidacy. He later joins in supporting nominee Richard Nixon. Reagan sends in the National Guard to break up protests at the University of California at Berkeley after university officials block activists' efforts to create a "Peoples Park". Reagan is re-elected California governor. 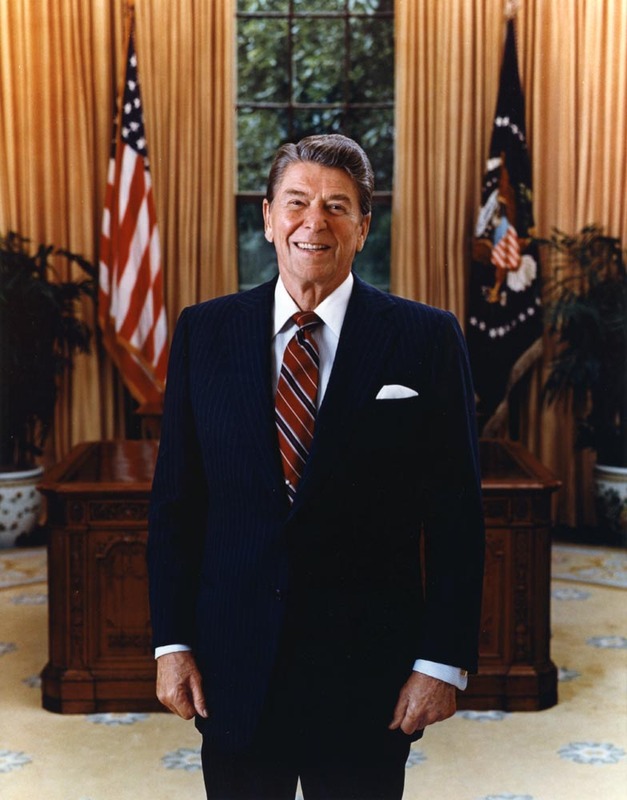 For several months after his gubernatorial term ends, Reagan writes a syndicated newspaper column and provides commentaries on radio stations across the country. Reagan announces his candidacy for the Republican nomination for president. He loses the Republican Party's nomination to Gerald Ford, but a strong showing sets the stage for Reagan's election in 1980. In the meantime, Reagan works on his ranch, gives speeches, does radio commentaries and writes a weekly newspaper column. Reagan announces his candidacy for president. After winning the party's nomination, he chooses George Bush as his running mate. The platform calls for "a new consensus with all those across the land who share a community of values embodied in these words: family, work, neighborhood, peace, and freedom." Reagan is elected president in a landslide victory over incumbent Jimmy Carter. 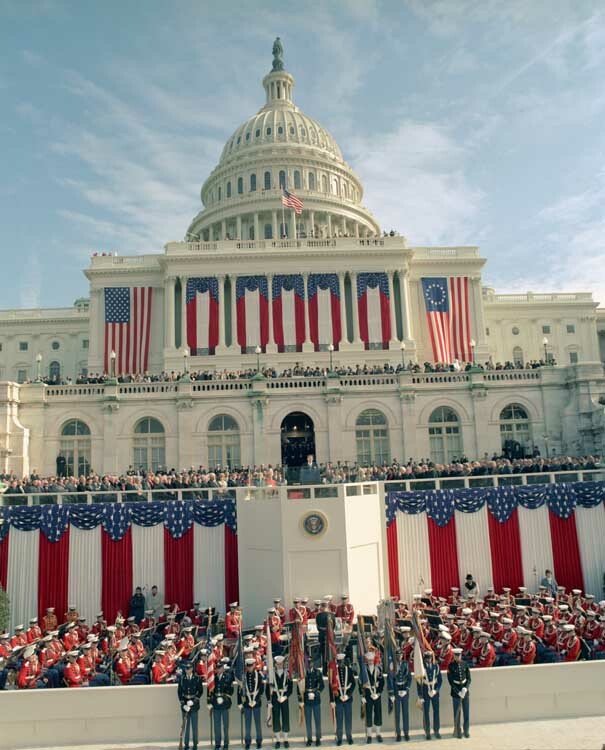 Reagan is sworn in as the 40th president of the United States. On the same day, Iran releases the 52 remaining hostages who had been held at the U.S. embassy in Tehran for 444 days. Reagan is shot in the chest upon leaving a Washington hotel but makes a full recovery after surgery. Three other people, including Reagan press secretary James Brady, are wounded in the assassination attempt. John Hinckley Jr. is charged but found not guilty by reason of insanity. Reagan appears before Congress for the first time since the assassination attempt. He receives a hero's welcome and overwhelming support for his economic package, which includes cuts in social programs and taxes, and increases in defense spending. Congress passes Reagan's tax bill. Instead of a 30% tax cut over three years, Reagan accepts 25%. Air traffic controllers go on strike. Reagan gives them 48 hours to get back to work, and fires those who refuse. Reagan appoints Sandra Day O'Connor as the first female justice on the U.S. Supreme Court. Reagan concedes that the United States is in "a slight recession" but predicts recovery by the spring. Budget Director David Stockman charges that the 5% economic growth rate that the administration had assumed was a "rosy scenario," and pans "supply side" economics as a way to benefit the rich. In a speech to the British House of Commons, Reagan predicts "the march of freedom and democracy...will leave Marxism-Leninism on the ash heap of history ..."
The nation sinks into its worst recession since the Great Depression. Reagan fears budget deficits as high as $200 billion. On Nov. 1, more than 9 million Americans are officially unemployed. Reagan submits his fiscal 1984 budget to Congress. The recession, tax cuts and increased defense outlays are blamed for a projected $189 billion budget gap. Reagan vows to "stay the course," rejecting advice to raise taxes or cut defense. In a speech to the National Association of Evangelicals, Reagan warns against ignoring "the aggressive impulses of an evil empire," the U.S.S.R.
Reagan unveils his proposal for a Strategic Defense Initiative, later dubbed "Star Wars," in a national speech: "I call upon the scientific community in our country, those who gave us nuclear weapons, to turn their great talents now to the cause of mankind and world peace, to give us the means of rendering these nuclear weapons impotent and obsolete." A Soviet fighter downs Korean Air Lines flight (KAL 007), killing all 269 people aboard, including 61 Americans. Reagan denounces it as a "crime against humanity." A suicide truck bomber crashes into the U.S. Marine barracks in Beirut, killing 241 members of the peacekeeping force. U.S. troops invade Grenada to oust Marxists who had overthrown the government, and to protect U.S. medical students on the Caribbean island. Reagan calls for a return to arms talks with the U.S.S.R. In a televised speech, Reagan urges helping the Contra "freedom fighters" in Nicaragua. Reagan gives an emotional speech in Normandy, France, commemorating the 40th anniversary of D-Day. Walter Mondale accepts the Democratic presidential nomination and promises to raise taxes. While checking a microphone prior to a radio broadcast, Reagan jokes: "...I've signed legislation that will outlaw Russia forever. We begin bombing in five minutes." In a debate with Mondale, Reagan's poor performance raises the "age issue." Congress outlaws funding for military aid to the Nicaragua Contras. In his second debate with Mondale, Reagan quips: "I will not make age an issue of this campaign. I am not going to exploit, for political purposes, my opponent's youth and inexperience." Reagan defeats Mondale in landslide. Reagan carries 49 states -- 525 electoral votes to Mondale's 10, and 59% of the popular vote. Reagan, 73, begins a second term, making him the oldest president ever to be sworn in. TWA Flight 847 from Athens is hijacked by terrorists. 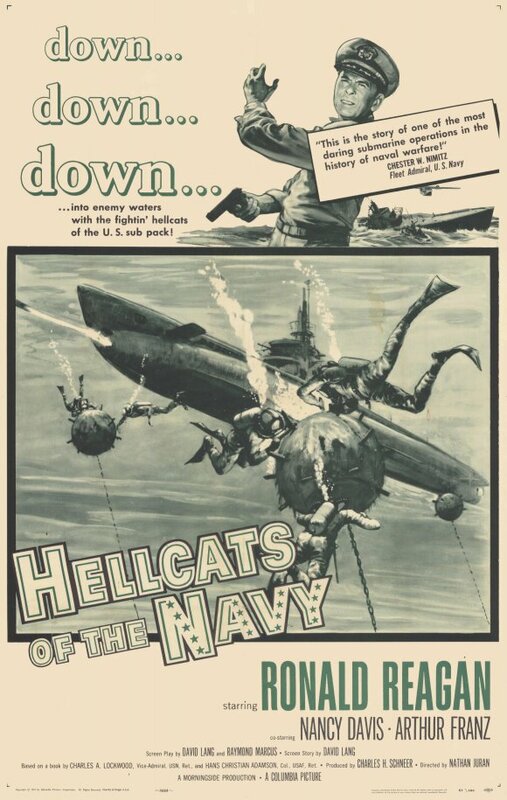 The pilot is forced to fly to Beirut, where hijackers beat and kill a Navy diver. The plane is flown to Algiers, then back to Beirut again. Most passengers are released; 39 are held captive in Lebanon. Reagan vows that the U.S. will never give in to terrorists' demands. The remaining hostages are freed after 17 days. Reagan undergoes surgery for colon cancer and is released from the hospital a week later. Reagan and Soviet leader Mikhail Gorbachev hold a "fireside" summit in Geneva. The leaders disagree on the Strategic Defense Initiative but pledge to meet again and seek a 50% cut in nuclear arms. Reagan undergoes surgery for polyps on his colon. The U.S. space shuttle Challenger explodes shortly after liftoff, killing all on board -- six astronauts and teacher Christa McAuliffe, the first civilian to go into space. Reagan orders air strikes against Libya in retaliation for the bombing of a West Berlin disco in which two U.S. servicemen were killed and more than 200 people were injured. A Reagan-Gorbachev arms summit in Reykjavik, Iceland, ends without agreement after a rift over SDI. Reagan admits sending some defensive weapons and spare parts to Iran but denies it was part of an arms-for-hostages deal. National Security Adviser John Poindexter resigns and national security aide Col. Oliver North is fired in the widening Iran-Contra affair. In a press conference, Attorney General Edwin Meese announces that $10-$30 million of profits from the sale of U.S. arms to Iran had been diverted to the Nicaraguan Contras. The Tower Commission report on Iran-Contra concludes that Reagan's passive management style allowed his staff to mislead him about the trade of arms to Iran for hostages held in Lebanon and to pursue a secret war against the Nicaraguan government. 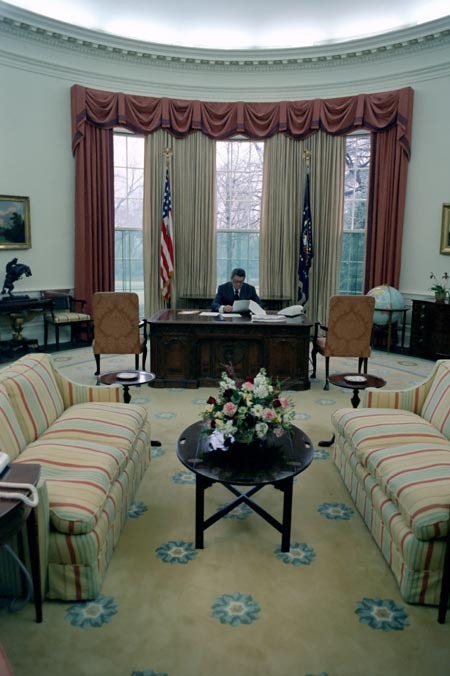 Reagan yields to pressure from his advisers (including wife Nancy) to fire Chief of Staff Donald Regan. Reagan acknowledges a "mistake" in the Iran-Contra affair. 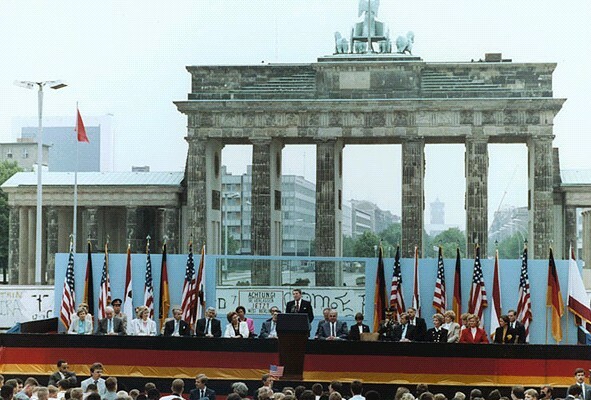 In a speech at Berlin's Brandenberg Gate, Reagan demands Gorbachev "tear down this wall." In a Washington summit, Reagan and Gorbachev sign Intermediate-range Nuclear Forces (INF) treaty to eliminate 4% of the superpowers' nuclear arsenals. It is the first U.S.-Soviet treaty to provide for destruction of nuclear weapons and to provide for on-site monitoring of the destruction. Oliver North, John Poindexter, and two others are indicted by a federal grand jury on charges of conspiring to defraud the U.S. government by secretly providing funds and supplies to the Contras. The Soviet Union agrees to begin withdrawing troops from Afghanistan. 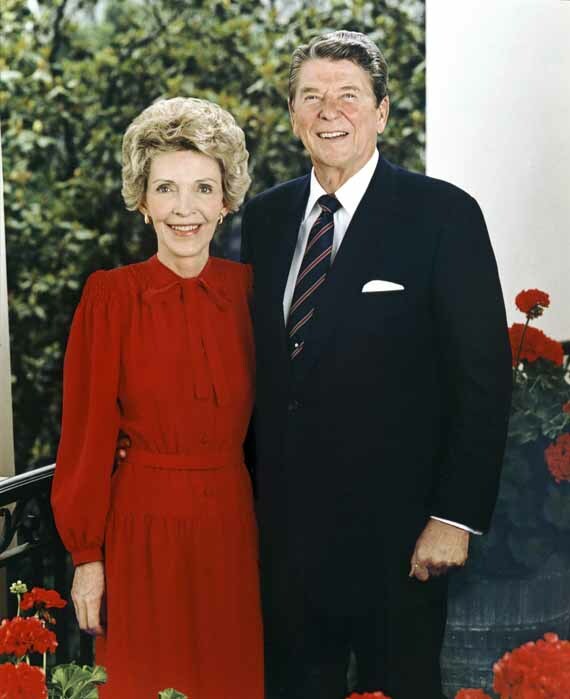 In his memoir For the Record, Donald Regan reveals that Nancy Reagan relied on an astrologer to set the dates for her husband's public appearances. The Senate ratifies the INF treaty, the first arms-control agreement since 1972's Strategic Arms Limitation Treaty (SALT I) to receive Senate approval. Vice President George Bush defeats Massachusetts Gov. Michael Dukakis to become the 41st president of the United States. Reagan gives his farewell address to the nation, in which he says the so-called Reagan revolution "made a difference."